Banglalink 29Tk Recharge Offer! 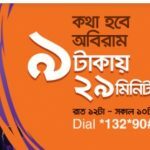 Bangladeshi one of the biggest and most telecom operator Banglalink is providing for their valuable customers to Banglalink 29Tk recharge Offer. Now all BL users can get 29mb free data and 1 paisha call rate offer after only recharge tk 29. The customers who want to know about this offer, just read this full article to get all more information about Banglalink Tk 29 Recharge Offer. To Activate BL 1 Paisa/sec Call Rate + Bonus 29 MB Internet Offer, Customers need to recharge only 29 Taka. The Validity of Banglalink 29 TK Recharge Offer in 3 days. Customers can activate this Banglalink special Call Rate Offer Multiple times during the campaign duration. BL 29 Taka Recharge Offer lower call rates will be applicable for FNF and Super FNF numbers. After the 29 TK Recharge special tariff validity period, the previous offer/package will re-apply. 1 second pulse will be applicable. This Recharge Offer is a limited time offer. To check Banglalink 29 MB Bonus internet Offer, customers need to Just dial USSD Code *124*129#. VAT +SD+ SC will be applicable. How to Deactivate or Stop Banglalink 29 TK Recharge Offer? This is very easy to Deactivate BL 29 Taka Recharge Special Call Rate Offer. First, go to the Mobile Dial Option and Dial USSD Code *166*129#. We hope all BL customers can get more update news about Banglalink 29Tk Recharge Offer.Have you any question about this offer, just comments the box.We will try best to solve your problem.Thanks all customers for being with us. To know about How To Increase Banglalink Internet Validity.